So you think that lightning doesn't strike the same place twice? Think again! We are all familiar with the idiom ‘lightning never strikes the same place twice’. Well, myth busted! The truth is that lightning can strike one place more than 50 times, and can cause severe damage in the event that it does. Not only does this disprove the idiom, it also alerts us to the fact that when it comes to Mother Nature, we can never pre-empt the weather conditions. If you have a two poles of different heights, science tells us that the lightning will follow the path of least resistance – and strike the one that is tallest due to the minimal amount of matter that surrounds it. If you consider your home, the location, and the height at which it stands, the chances are high that you may be at risk. 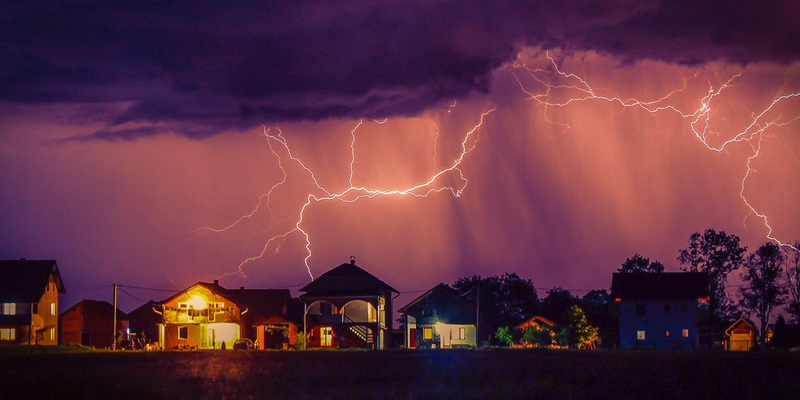 When it comes to protecting your home against severe lightning strikes, there are a number of things that you should know. While the science of lightning may not be of interest to you, the fact that insurance companies understand the risk of lightning sure is. From structural damage to electrical damage, insurance companies provide affordable insurance products that will assist in repairing or replacing the damaged items. However, it is important to ensure that you have taken the necessary measures to protect your home and belongings from lightning to the full extent of your capability. Ensure that your insurance policy includes cover for the risk of lightning damage. While Mother Nature can be unpredictable, there are ways in which to protect your home from her wrath come large storms. If you have a love for large trees, be sure to plant them away from the structure of your home – in the event that one of the trees is struck by lightning, the debris will not fall onto your home, protecting it from damage or fire. If you have any bodies of water, ensure that they are fenced off – water conducts electricity which can be fatal to anyone who comes into contact with the water during a storm. Thatched roofs or high-rise houses are at a higher risk of damage than single story homes. If you do have a thatched roof or boast a two or three story home, be sure to invest in a lightning conductor that can be situated within your garden. Not only will this deviate the lightning in the event of a severe storm, but it will also ensure that your electronic items remain protected. However, it is still important to unplug all of your items during a storm – you can never be too sure about where lightning may strike. In the event of injury due to lightning, it is important to immediately call emergency services. South African emergency ambulance services can be contacted on 10177. It is important to monitor the injured until the paramedics arrive on site. Otherwise, it is important to ensure that you do not move or hassle the victim as cardiac arrest and severe burns can lead to death. If you’re wondering about whether or not your home is insured for damage caused by lightning, be sure to contact your insurance provider. Alternatively, contact MiWay today for a no-obligation quote on home insurance – we guarantee that you’ll be thankful that you did! Click here to read more about how to handle common household emergencies.